The resources listed below have been chosen as specifically helpful to your assignment. Additionally, you may well want to check your representative's office website or give them a call for information. The Book of the States is collection of tables on various topics, divided by state. It may help you flesh out your District Profile. The information subjects covered are a bit random, but include things like finances, taxes, education, business incentives, capital punishment, etc. America Votes contains tables of election data, by state, for Presidential, House, Senate, Gubernatorial, general, primary, and special elections. 2015-2016 is the most recent publication available. For legislation simply select "All legislation" in the drop down menu and enter the area or specific legislation you are interested in. 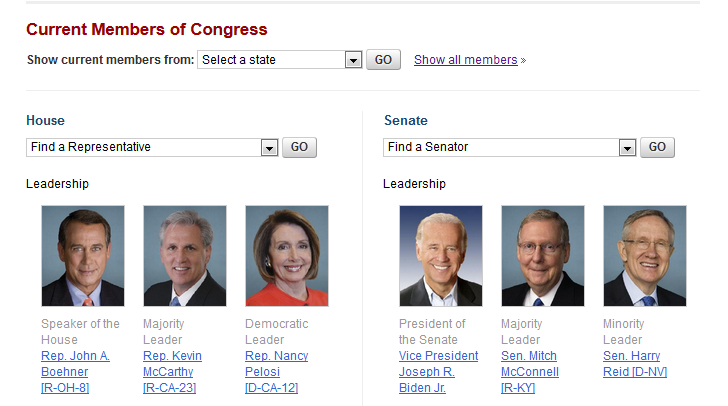 For members, simply scroll down for "Current Members of Congress" as indicated to the right. You can look for specific member of the House or Browse by State. This one is great for snap shots on your member of the House. Information will vary representative to representative. All have a basic biography, but some also include election breakdowns, group ratings, journal ratings, key votes in congress, committees and more. Older years are in the Stacks. The official government website for the House of Respresentatives. You can easily browse congress members, current legislative activity, and more. "The House Explained" in the top menu bar provides a good basic explanation of how the House works. Use the "Roll Call Votes" to see how a representative voted on a specific piece of legislation. From The Center for Responsive Politics, a nonpartisan, independent, and nonprofit organization that tracks money in U.S. politics and its effect on elections and public policy. "OpenSecrets.org... [is] the most comprehensive resource for federal campaign contributions, lobbying data and analysis available anywhere." Search by your representative's name as shown to the right. 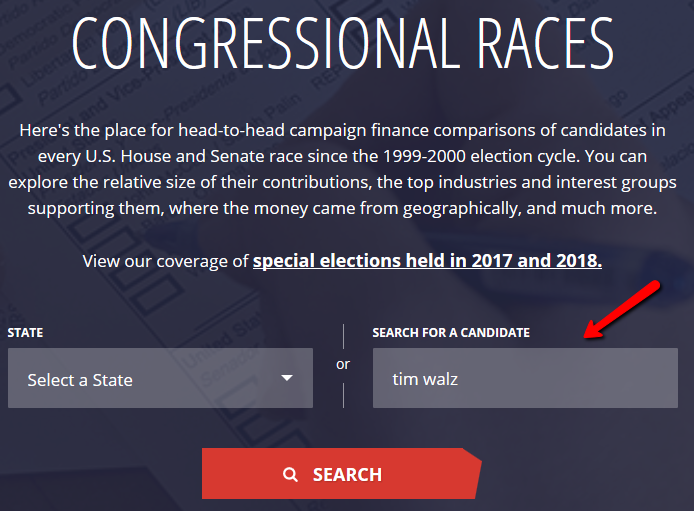 Select which congressional race you want campaign information on. Once you have selected a race, the top menu, as seen below, will be your key for navigation. You can view election data, which industries, PAC's, and individual donors who have donated to the representative's election campaign, a breakdown of funds by geographic location (in and out of state), and much more!